The English Channel is classified as the world’s busiest waterway, with an average of over 400 commercial shipping movements a day. For a yacht under way in the channel, maintaining a good all-round lookout is therefore imperative to remaining safe and sailing around shipping. With its hull silhouetted against the skyline by day, or its navigation lights lighting up the seas at night, there is every reason that you will see a large commercial vessel before it sees you. Happily, this should give you plenty of time to determine whether a risk of collision exists, and to take avoiding action if necessary. If visibility closes keep tabs on everyone via your radar, if you have it. Except when under way in congested waters, it is best to assume that the big vessel’s officer of the watch (OOW) is alone on the bridge with both steering and propulsion on automatic and one hundred and one screens to monitor. In spite of their best intentions, looking out of the window might not be their top priority, and they are likely to be relying on radar and AIS alarms to advise them of possible course conflicts. Bad luck if you don’t have AIS and yachts often don’t show up well on ships’ radar. When a large vessel appears on your patch of sea, treat it as if there is no one in charge, and it is likely to change course suddenly without any warning, because he doesn’t know you are there. Change course early and go behind him if crossing; standing on and calling him on VHF is often wasting valuable time and could be dangerous. He may also not be alone, shame to miss him and then hit the one riding unseen close to his stern quarter. Similarly keep well clear of fishing vessels, especially when approaching ports, as they will more than likely be occupied aft processing their catch. 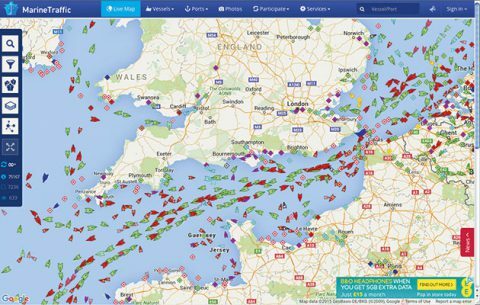 Whilst planning your passage at home before your trip, it will be useful to get a picture of shipping concentrations, as well as finding out what kind of shipping to expect, by consulting AIS websites such as www.marinetraffic.com or www.vesselfinder.com. Given this density of traffic, crossing shipping lanes should be carefully planned, and a prudent yachtsman might well choose to be prepared with his engine ticking over as he goes over the separation lanes. There is no substitute for a regular 360° look out, particularly behind that genoa, and aft. Listen as well; at night the first indication of a large vessel in the murk can be her diesel engine rumble or her splashing prop. Good luck and stay safe. For information on different types of marine traffic you may wish to read “A yachtsman’s guide to shipping” recently published by Yachting Monthly.